The global number of pay TV subscribers will rise by 134 million between 2016 and 2022 driven largely by gains in Asia Pacific, according to Digital TV Research. The new research claims that the total number of pay TV subscribers will climb from 959 million in 2016 to 1.09 billion in 2022, after passing the 1 billion mark in 2018. The Asia Pacific region is tipped to add 92 million subscribers between 2016 and 2022, while Sub-Saharan Africa is expected to double its total. China will continue to supply about a third of the world’s pay TV subscribers while India will account for another 16% of the total by 2022, meaning together the two countries will represent nearly half of the world’s pay TV subscribers, according to the report. “Doom mongers in the US have been predicting the demise of pay TV for some time. Although the US is losing pay TV subs, there is still a lot of life left in the sector. Furthermore, they are ignoring the rest of the world,” said Digital TV Research principal analyst, Simon Murray. 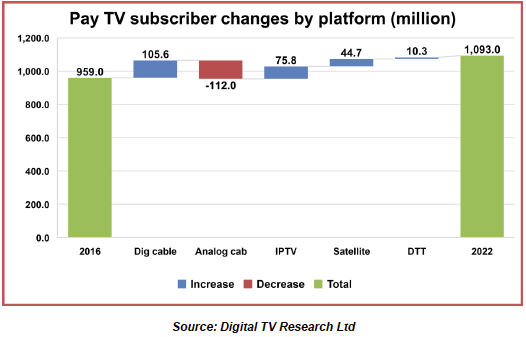 In total, Digital TV Research predicts that pay TV subscriber numbers will fall in 18 countries but will double in 26 countries between 2016 and 2022.